Last Friday, I took it upon myself to introduce a coworker to a neighbor in the hopes of furthering our relationship with the neighbor’s employer. Of course, my motives may not have been all altruistic as a free lunch was in store for me. We selected the Good Dog as it falls about halfway between our offices and has the relaxed atmosphere to lend itself to a quick-lunch and good conversation. 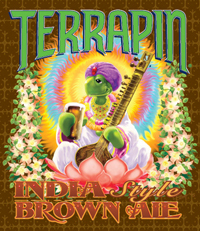 A quick review of the beer menu brought a bottle of Terrapin India Brown Ale to my eye. This American brown ale is a product from the Terrapin Beer Company with an ABV of 6.2%. The aroma is a little bit floral, a lot bit hops but the combination yields a flavorful, well carbonated brew. However, after a quick check of the Terrapin site, I am a little concerned that Terrapin has discontinued this product and renamed it Hop Karma. This leads me to suspect that the Good Dog either doesn’t turn over their stock as quickly as I would have expected or got some deal from their distributor to push some discontinued products. As the bottle could have been fresher, I would give this beer a B. The average score at the Beer Advocate is a B so I would welcome the chance to try a new bottle of Hop Karma and see if there is a difference.